Looks like Honda showed two new PCX variants at the Tokyo Motor Show, an Electric model and a Hybrid model. The information that Honda released is sadly light on specifications, but the electric model actually has battery swapping (although with rather weak cargo space, unfortunately, something Gogoro has managed to avoid), with two packs that are reportedly 1 kWh (smaller than Gogoro’s packs). 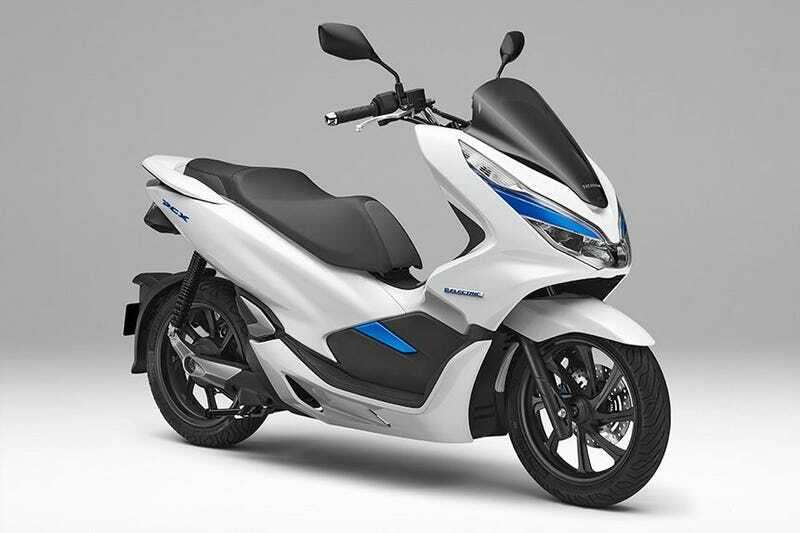 The hybrid model is using the brushless starter/generator that Honda’s been using on the PCX for a while (to enable stop/start operation in some markets), along with a higher capacity battery - it’s unclear whether the starter/generator has been upgraded, though. Even if not, it’ll be in the ballpark of 260 watts, that’s certainly better than nothing - when you’ve only got 11.7 hp (for the PCX 125, which I’m guessing this will be based on), another 0.35 hp (especially when it’ll come in as low-end torque) certainly doesn’t hurt.